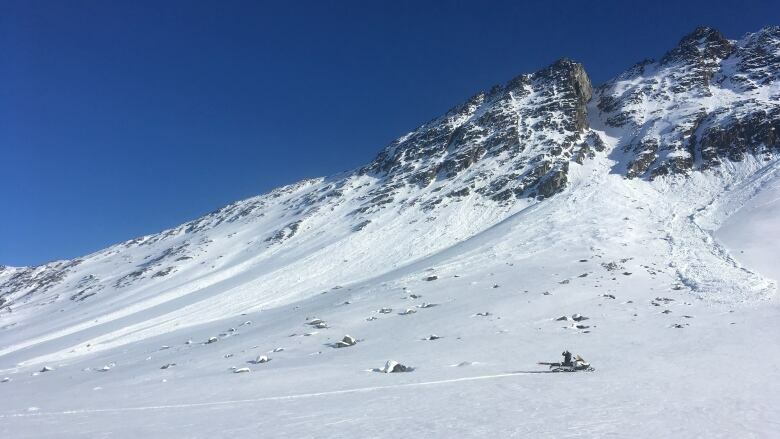 'We have an atypical snow pack combined with some atypical weather, and that's resulting in some unusual avalanche conditions,' says Eirik Sharp, a forecaster for Avalanche Canada. Unseasonably warm weather this week in Yukon has made things a little dicey in the alpine regions, according to Avalanche Canada forecaster Eirik Sharp. "Any large swing in the weather, whether it be warm temperatures, rapid change in temperatures, rain or snow, is typically associated with an increase in natural avalanche activity," Sharp said. "That's definitely something we've seen in the White Pass over the last couple of days." The White Pass area near the B.C.-Alaska border is a popular springtime destination for backcountry skiers and snowmobilers from Yukon. But Sharp is urging people to be extra cautious right now. He says the current conditions are typically seen later in the season. "I often rely on, kind of, my habits of, 'the snow is normally like this at this time of year' — it informs where I go in the terrain. I don't think we can rely on that this much, this year," he said. "That dramatic warming has really shocked the snow pack in the White Pass, and it's taking some time to adjust. As it adjusts, it sheds snow in the form of avalanches." According to Avalanche Canada, the snow pack is unusually thin this year in the White Pass, especially at lower altitudes. Sharp says that means any weak layers are closer to the surface, and more likely to result in an avalanche — either natural or human-caused. The danger also increases when soft snow crusts over at night, Sharp says. When the icy crust breaks down during the day, avalanche activity increases. "So we have an atypical snow pack combined with some atypical weather, and that's resulting in some unusual avalanche conditions," he said. Things may improve on the weekend, Sharp says, if the weather changes. But he advises people to check the Avalanche Canada website for updated information and advisories. He also urges people to pay attention to where they are, avoid slopes where rocks and ground are exposed, and avoid areas that seem to be melting fast. "As soon as things start to get wet, it's probably time to back off into some safer terrain," he said.